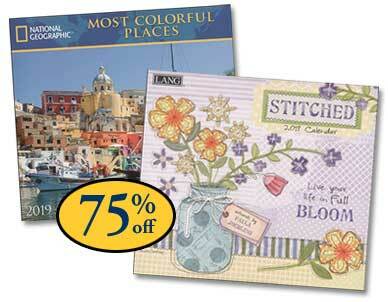 Perfect for home or office — Now 75% Off! New Price Reduction — all 2019 calendars reduced 75%! Quantities are limited; Order today! Give a "one-size-fits-all" gift everyone can use — including YOU! Our 2019 Wall Calendars showcase full-color reproductions of original art from many of today's leading artists. Perfect for home or office!